Address: 11011 W. Charleston Blvd. 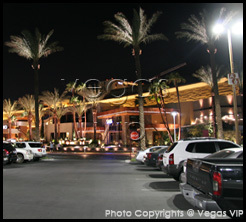 Red Rock Casino, Resort & Spa, set into the backdrop of one of Las Vegas' most recognizable natural features, Red Rock Canyon, combines breathtaking views of the Las Vegas Valley with a serene spa, sumptuous dining, well-appointed rooms, hip nightlife and an exciting casino. 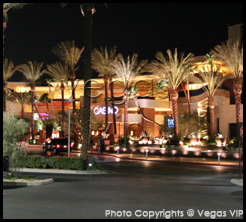 The hotel and casino features 414 rooms that are equipped with high-end amenities. Rooms include two plasma TVs, high-speed and wireless internet access and an iPod docking station. In the marble bathroom, guests can enjoy both a tub and separate shower. And of course, the bedding is to live for. The resort's 87,000 square-foot casino has more than 60 live table games and 2,700 slot and video poker machines. A 15-table poker room and 600-seat bingo hall round out the resort's extensive gaming options. Downstairs, Rande Gerber's Cherry Nightclub and a piano bar await for those looking to party in style. A 16-screen theater offers a respite from gaming and shopping, while the 3-acre pool complex provides plenty of room to lounge in the sun. For good eats, both high end and casual, check out T-Bones Chophouse & Lounge, Salt Lick BBQ, Cabo Cantina, Tides Oyster Bar and The Feast Around The World Buffet at Red Rock.